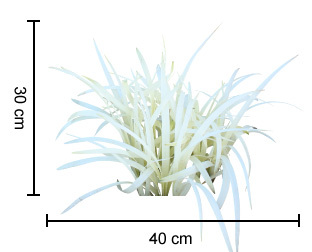 Description: Pure Blonde™ Liriope is a clumping plant with amazing foliage that stays blonde for up to 3 months, then slowly turns back to green to survive summer. If you cut back to the ground in July, it will re-shoot blonde in August to September. It’s still tough, though the tips may burn in full sun or windy sites, the foliage will stay clean in shady positions. Size: 30cm high x 40cm wide. 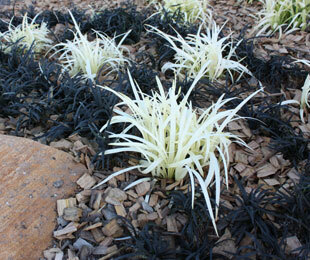 Uses: Mass plantings, feature planting and great contrast to Black Mondo. Position: Full sun to heavy shade, prefers protection from windy exposed conditions. Tolerates frost, drought and humidity. 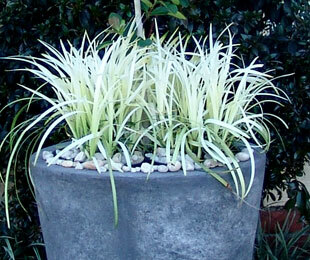 Pure Blonde™ Liriope suits sandy to clay soil types. Care: Water as required for 8-13 weeks until established, then water as required. Plant in a well mulched garden (chunky mulch is recommended). Use slow release fertiliser in spring. Every year cut back to the ground in July for full blonde new growth (will still get some blonde new shoots if not cut back, but looks better with pruning every year). For more detailed information on Pure Blonde™ Liriope click here.